Home > Resources > Recover Android > [3 Ways] How to Recover Lost Screenshots on Android Phones? Summary: Get lost of important screenshots on your Android phone? Please don't worry, just read on to get more information on how to recover lost screenshots on Android phones, and also some useful tips to avoid to lose screenshot from Android again. People like to take screenshots when they encounter with favorites on web, games and videos, or when they need to save some important information, such as account info, messages, cautions, photos and more. Thus they can save the screenshots in album or share them with their friends immediately. This is a common situation where Android users lost their data, screenshots are no exception. Some screenshots are lost due to accidental deletion, and some due to hard drive failure, system crash and some other unknown reasons. However, please take it easy, there are several ways for you to get your lost screenshots back to your Android phone. Believe or not, just read on to know how. 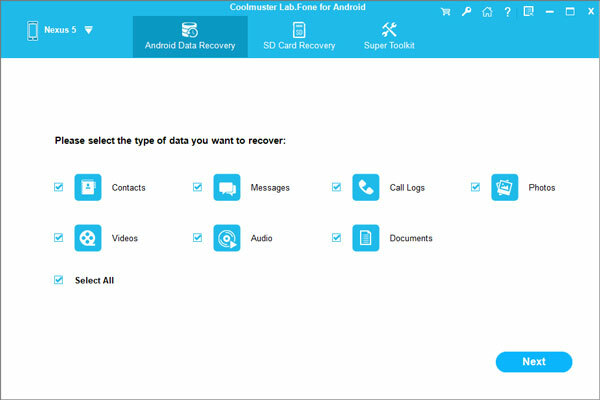 To recover screenshots on Android phones or Android tablets, it is highly recommended to you the best - Coolmuster Android Data Recovery. It can help you quickly find out the deleted screenshots and regain them from Android devices with several clicks. It supports images in .jpg, .png, .gif, .bmp, formats and more. What's more, it allows you to extract and display the deleted photos only so as to choose the desired screenshots for recovery. And it is fully compatible with most of Android brands, such as Samsung Galaxy, HTC One, LG G, Sony Xperia, Huawei Honor, Google Nexus, OPPO, Meizu, ZTE, Motorola, Xiaomi and so on. And the latest Samsung Galaxy S9 Plus and Galaxy S9 are also supported. 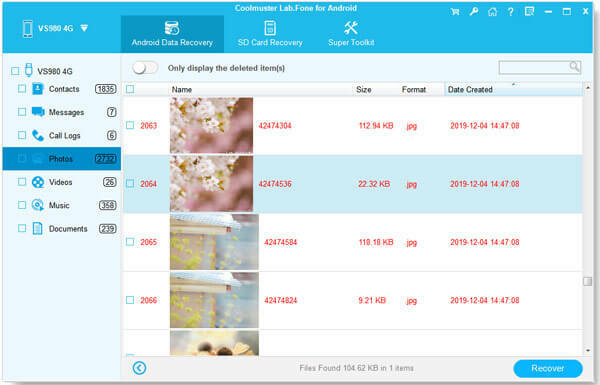 The following guide tells you how to recover lost screenshots on Android device by using this Android Data Recovery. Actually it can also rescue contacts, text messages, photos, videos, music, call logs, audios, documents and so forth. First of all, launch the Android data recovery software on your computer and connect your Android device to the computer via a USB cable. Open USB debugging on the phone so that it can be detected by the program. - For Android 2.1-2.3: Go to "Settings" > "Applications" > "Development" > "USB debugging" and turn it on. Next, you should select the file types you want to recover. Here, you should select "Photos" where your screenshots are saved. Switch on the button of "Only display the deleted item(s)" on the top, thus all lost pictures are scanned out and you can view to find the screenshots you need. At last, tick off those you want to rescue back and hit the "Recover" button on the bottom right corner. Wait patiently and all the selected screenshots will be recovered and saved to your computer soon. What to do if you don't have a computer besides you? If you've synced your Android photos to a cloud storage service, such as Google Photos, Onedrive or the others, your deleted screenshots are supposed to be synced to the cloud storage service as well. So you can easily restore deleted screenshots on Android without a computer and without root. For example, if you've saved your photos to a Google account (usually a Gmail account), you can easily recover deleted screenshots from Google Photos. Note: Deleted Google Photos will be permanently deleted from the Google Cloud after 60 days, so please make sure your deleted photos have been deleted within 60 days. Step 1. Run both Google Photos and Photos apps on your Android phone. Step 2. Tap the "≡" icon in the upper left corner of the screen. Step 3. Select the "Trash" option on the pop-up window. Step 4. Preview the deleted photos and select the screenshots you have lost to restore on Android. Dropbox contains a junk file folder, which contains deleted photos, books, documents and other files for 30 days. To recover lost screenshots from Android, you can try to recover them from Dropbox. If needed, please refer to the following steps to make it. Step 1. Launch a browser on computer and visit Dropbox's website on your desktop. Step 2. Log in to Dropbox with your information. Step 3. Go to "File" > "Deleted Files" on the home page to view all the recently deleted files here. Step 4. Select the screenshots that you want to restore, click three-dot icon and choose "Restore" option to get your deleted screenshots back. Now, you have 3 methods to recover your lost or deleted screenshots from Android phone, please choose your favorite one to help you restore deleted screenshot. If you have any problems, please leave your comments below and we will try to help you out as soon as possible. By the way, the Android Data Recovery is most functional and welcome, why not have a try?